It's 6:30 p.m. on opening day and a man in full, bloody makeup, with a listless chainsaw at his side, struggles with the ScareHouse Banner in the parking lot of the Pittsburgh Zoo. A short queue has already begun to form. A staff member in a day-glo orange construction vest separates us according to our pre-purchased entry time and whether we have tickets to "The Basement," a more fully immersive haunt, sold separately from entry to the main manor. A couple who drove from Indiana, clad mostly in black leather and big boots, smirks at each other and steps into the line reserved for the basement crowd. They seem braver than most. Soon we'll board the school bus that acts as a shuttle to Etna, where ScareHouse, voted Best Haunted Attraction by City Paper readers, looms. 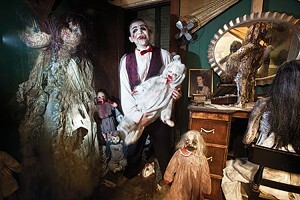 The main haunt is broken into three distinctive theaters: "The Summoning," "Krampus: Come All Ye Fearful" and "Trick 'r Treat: Hallowed Grounds." Each adheres to a visual and psychological theme of horror, but the transitions between them are seamless. A large foyer with a waiting ticket-taker in full costume serves as the entrance to The Summoning. Off to the side, an expressionless dancer moves her body, sinuously accompanied by a mustachioed accordion player with a manic look in his eye. Plunging into this beautifully curated world, where four of the senses are fully engaged (touching is not allowed upstairs), the realization dawns that you'll be living this for the next 30 to 40 minutes. This is only the beginning of the journey your small group will take. Traveling through the spaces, I hit obstacle after obstacle, never getting a chance to fully adjust, or fully get used to the amount of screaming I was doing. The sets, costuming and makeup are worthy of any professional Hollywood movie. It was so good, in fact, that I once complimented an actor instead of screaming when he rounded a corner. During another scene, what felt like real snow drifted into my hair from the ceiling. It's no surprise that the haunt has earned praise from director and writer Guillermo Del Toro, himself the master of creepy scenescapes and characters. For more scary fun, sign up for the ground I dared not tread, The Basement. For an additional fee, thrill-seekers over the age of 18 can produce photo ID, sign a waiver and walk two by two into their own nightmares. Participants are told they may not touch the actors but should expect to be touched, restrained and blindfolded. After a trip there last year, actor Elijah Wood was quoted gleefully telling late-night TV host Seth Myers that he was made to "confess my sins" and that it "gets oddly, uncomfortably sexual." Enter at your own risk, Halloween crazies. I'll be on the couch.